An economists' report says an ambiguous definition of 'retail' in the measure could pull in more than twice as much cash as supporters have claimed. What do you consider "retail"? The definition of the word looks to be one of the biggest sticking points between the no and yes campaigns on the Portland-wide Ballot Measure 26-201 to create a "Clean Energy Fund." The fund would be fueled by a 1 percent surcharge on large retailers in the city of Portland — those with more than $1 billion in national sales and more than $500,000 within city limits. Voters will get to decide on it before 8 p.m. on Election Day, Nov. 6. While yes campaigners have said the tax would bring in "more than $30 million" for clean energy jobs programs and energy-saving retrofits, an ECONorthwest study says the tax could actually cost between $43.1 million and $79 million. The July study was released Monday, Oct. 9, by the no campaign. "The large estimated range is primarily a function of ambiguous wording in the Initiative itself and uncertainty over how the Initiative would be implemented by the City of Portland if it were to be passed," reads the report paid for by Grow Oregon, a supporter of the no campaign. The report by the respected Portland-based economic research group used two definitions of retail to decide how the tax could be applied. The broader definition, based on feedback from accountants and tax preparers, included business-to-business activity, such as legal services, freight fees and telecommunications. But the yes campaign, Yes for Portland Clean Energy Fund, called the report a red herring. Pham said the campaign used — and will continue to advocate for if the measure passes —a narrow definition of "retail." The ECONorthwest report worries that construction, warehousing and other sectors could be included in the definition, creating ripple effects that would add an estimated $35.9 million to the coffers. For her part, Pham said she would be fine with that — "Would it be bad to raise a little bit more money for clean energy projects?" — but said that the campaign is using code 44-45 of the North American Industry Classification System definitions. That corresponds to ECONorthwest's lower tax burden finding of $43.1 million. Pham dismissed the report as a scare tactic. "We would pursue continuing that more narrow definition that we landed on," she said, noting vetting of the definition by the court system and several nonprofit groups, like the City Club of Portland, which supports the measure. However, Andrew Hoan, the Portland Business Alliance's new president, blasted the measure for being a regressive double tax that would make everyone — especially the poor — pay twice for programs already run by the Energy Trust of Oregon. Hoan called for a "serious conversation on revenue" to augment the Energy Trust of Oregon instead of a new gross receipts tax. "Why ask those who can least afford it to pay for it?" he asked. Hoan said the proponents of the measure should have paid for their own study of the measure's effects before putting it on the ballot. 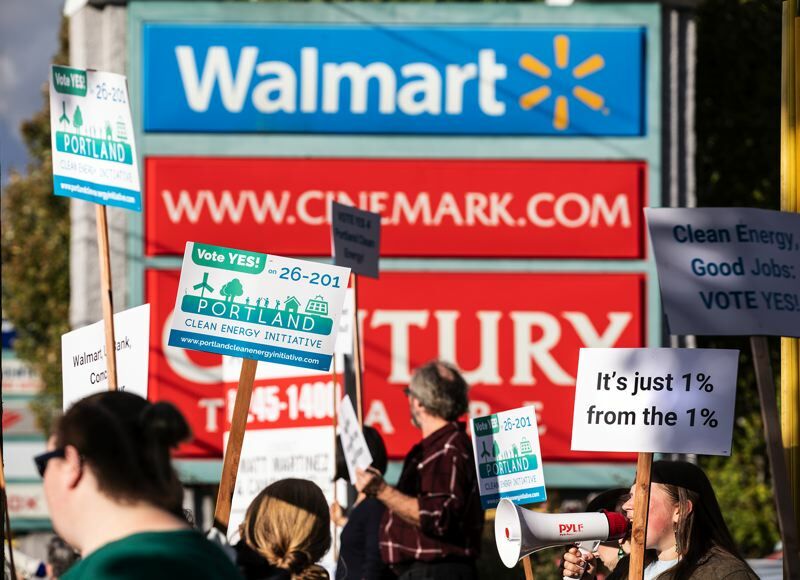 According to filings with the Oregon Secretary of State, ECONorthwest has received about $25,000 so far from the no campaign, though it's unclear how much the study cost. "Facts shouldn't be accused of being a red herring," Hoan said. "Science, means-tested work is the hallmark of good policy. Just like climate change science." The PBA president said the business community agrees with the objectives of more green jobs training and retrofits for low-income housing — programs Energy Trust doesn't typically pay for — but disagrees with how to pay for it. Hoan declined to speculate if the business community would help advocate for a narrower, cheaper definition of retail in the city implementation process, if the measure passes. But he did predict that the language of the measure would create problems if passed. "This initiative, if it passes, could have a lot of legal, technical problems that just create a serious delay in delivering (on its) promises," he said. "We're all concerned about this roll out." The PBA president also criticized the measure for being a permanent tax with no sunset or renewal provision. Measure 26-201 will just end up making Portland even less affordable, he argued. "The low-end estimates that they are shopping around are just not correct," Hoan said. "This is a major tax that they are proposing." He said Portlanders would much rather spend this kind of money on the "higher priorities" of addressing substance abuse, mental illness and homelessness. "This seems to be a real misalignment to Portland priorities," he said. In 2016, 57 percent of voters in Multnomah County approved Measure 97, a similar-style tax on large companies' retail sales — but the measure ultimately failed statewide: 59 percent against. The yes campaign: Yes on Clean Energy Jobs political action committee has so far raised about $159,000, with more than half of that coming from in-kind contributions. By press time, it had spent all but $27,254 of that. At $30,000, the largest contribution came from the Asian Pacific American Network of Oregon, a social justice nonprofit focused on people from Asian and Pacific Islander nations. The campaign has received in-kind donations worth thousands of dollars from several other nonprofit organizations, such as Verde, Coalition of Communities of Color, the Sierra Club, Physicians for Social Responsibility, the Audubon Society and Columbia Riverkeeper. Out-of-state contributions include $1,000 from an individual named Elizabeth Buck, $529 worth of work from the Climate Solutions nonprofit and $500 from an individual named Kalima Rose. The no campaign: Keep Portland Affordable political action committee has raised nearly half a million dollars in cash and in-kind contributions. By press time it had spent about half with $194,000 left. Top contributors, each with $40,000 donations, were the no campaign PAC on the 2016 ballot Measure 97, the Oregon Business and Industry PAC, The Papé Group contractors, and Lake Oswego-based Greenbrier Companies, a worldwide transportation manufacturer. Out-of-state contributors include Kroger/Fred Meyer, Amazon, US Bank, Comcast, Walmart and JC Penney.